Just a short post this morning. I choose love. It isn't always easy, because we are constantly bombarded with evil. 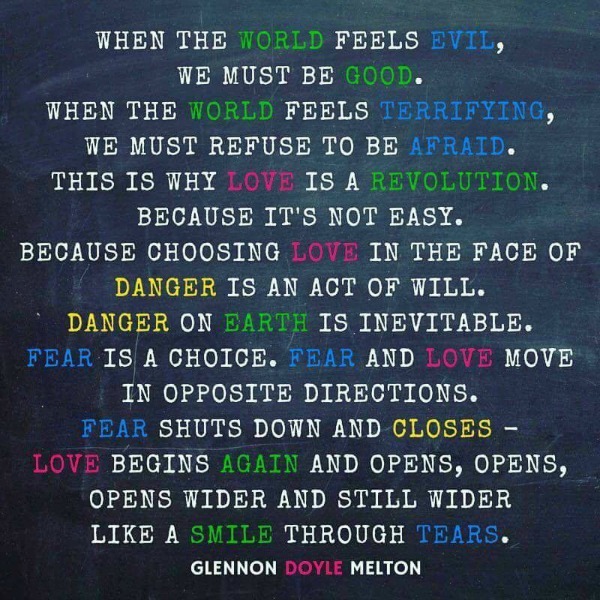 However, love is so much better than fear. It opens us up to so many possibilities. So I will practice, practice, and practice some more. Each time I begin to feel fearful I will consciously change that feeling to love. I am headed off to physical therapy for my knee. Went back to my surgeon and he showed me the x-rays of my knee. The implant is a tad crooked, but it has always been that way. I am going to try physical therapy to see if I can strengthen my knee so that I can avoid revision surgery. I am just loving my knee. It is the best knee ever. It is what I am hoping to avoid. Original replacements are no picnic, but revisions are even worse. Hoping for the best for your friend. good for you practicing that "love" instead of fear... good luck with your knee. I imagine that there would be a lot fewer knee revision surgeries necessary if the revision surgery had to be done free of charge. The way things are now, if the problem was caused by a mistake during surgery, since medical mistakes are very hard to prove, the patients bear the brunt of not only the pain of revision, but the expense as well. I hope your knee pain will subside and you can avoid any revision surgery. Take care. Wonderful inspirational post, Laura. Enjoy your weekend. Choosing love is the wise choice, even if it's not the easiest one. I hope you can strengthen your knee without a new surgery! Luckily I've never had any problems with my knees. Ankles? Another story. I choose love as well!